We have a great giveaway for September! Win an ARC of Printz Award winning author (for In Darkness) Nick Lake's new book Hostage Three. As Amy sets out to sea with her family on a yacht, she's only thinking about the peaceful waters and the warm sun. But she doesn't get either after a group of pirates seize the boat and its human cargo, and the family becomes a commodity in a highly sophisticated transaction. Hostage One is Amy's father--the most valuable. Hostage Three is Amy, who can't believe the nightmare she's in. But something even stranger happens as she builds a bond with one of her captors, making it brutally clear that the price of life and its value are two very different things. 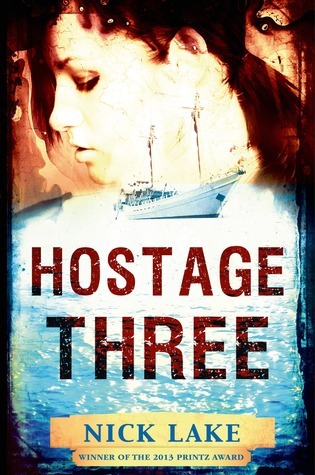 Hostage Three will not be released until November 12, 2013. If you would like us to review a book or host a giveaway, please email Arianna and Anna, at wanderinglibrarians@gmail.com. Please read our review policy prior to contacting us. Share book reviews and ratings with Wandering, and even join a book club on Goodreads. To access our full book list, click on the words "goodreads" above, and you'll be taken to our Goodreads account. Click on "read" to see the full list, which can be sorted by title or author. Click on any of the other genre tags to see the books that fall in that category. Wandering Librarians is licensed under a Creative Commons Attribution-NonCommercial-NoDerivs 3.0 Unported License.